In a remarkably brief appearance before the press Thursday morning at the White House, President Barack Obama announced that a US “counterterrorism” operation in January had killed two men long held as prisoners by Al Qaeda in Pakistan, near the border with Afghanistan. Obama reported that Warren Weinstein, an American university professor working as a contractor for a US government aid program in Pakistan, and Giovani Lo Porto, an Italian humanitarian aid worker helping earthquake victims in that country, had both been killed in a US attack, whose details he did not reveal. 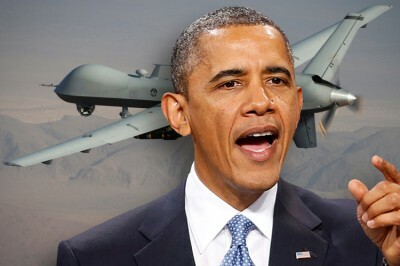 Press reports citing unnamed officials said the attack was a drone missile strike directed by the CIA. Earlier this week, the US government notified the families of Weinstein and Lo Porto and the Italian government of their deaths. According to a report in the Wall Street Journal, citing unnamed administration officials, “In February, US spy agencies began to pick up intelligence that Messrs. Weinstein and Lo Porto had been killed, but they didn’t know how. At the time, U.S. officials thought that in addition to a possible drone strike, the hostages could have been killed in a military operation conducted by Pakistani forces. The exact circumstances in which the two men died are extremely murky. Obama gave few details, and nothing said by him, or by the unnamed officials who briefed the corporate-controlled press, can be believed without corroboration. The only thing that appears definitive is that the two are dead. Obama said, “As president and commander-in-chief I take full responsibility for all counterterrorism operations, including the one that inadvertently took the lives” of Weinstein and Lo Porto. This “responsibility” comes with no consequences, however, since the Department of Justice has issued a legal finding to justify the CIA and Pentagon launching drone missile strikes against any target selected by the president. Many of the drone missile attacks are so-called signature strikes, meaning that they are triggered by the observation of certain behavior patterns—groups of men in turbans with guns, for example—rather than the identification of specific individuals. Given the conditions along the mountainous Afghanistan-Pakistan border and in rural Yemen, as well as across a wide swathe of the Sahara and Sahel regions of Africa, such a “signature” could be the basis for drone strikes against virtually the entire population. What this means in practice is that thousands of innocent people have been slaughtered, in Pakistan, Afghanistan, Yemen and other countries targeted for US drone strikes. By one recent estimate, one set of drone strikes targeting 41 alleged Al Qaeda leaders—some of whom survived the attacks—killed 1,147 people. The overall death toll from US drone missile strikes was estimated at 4,700 in 2013, and there have been dozens of strikes since then. If Weinstein and Lo Porto had been Pashtuns or Yemenis, rather than citizens of NATO powers, their deaths would have gone without any acknowledgement in official Washington. It was not so long ago that CIA Director John Brennan, in his previous capacity as White House counterterrorism chief, claimed that drone missile strikes were so surgically precise that not a single civilian had been killed. The official US government position is to refuse to negotiate for the release of hostages, a stance that has contributed to the killing of journalists like James Foley in Syria and Luke Somers in Yemen. Many European countries have paid ransoms to obtain the release of their citizens held as prisoners in Mideast war zones. The White House statement claimed that two Americans who allegedly enlisted in Al Qaeda had been killed during the same period as Weinstein and Lo Porto. Ahmed Farouq, identified by the White House as an Al Qaeda operative in South Asia, was said to have died in the same strike that killed the two hostages. Adam Gadahn, also known as Azzam the American, a native of southern California, was said to have died in a separate drone strike, also in January. The White House gave no details on how US intelligence agencies had determined the two men were dead. According to White House spokesman Josh Earnest, these deaths, too, were “inadvertent,” in that Farouq and Gadahn were not specifically targeted and, because the US government “did not have information indicating their presence at the sites of these operations.” Gadahn, however, was certainly on the White House hit list. He had been indicted for treason and had a price on his head, because of his role as an English-language propagandist for Al Qaeda. Attorney General Eric Holder argued, in a notorious 2011 speech, that an American citizen deliberately selected by Obama for incineration by drone missile had no legal recourse. The Fifth Amendment of the Bill of Rights, which mandates that no one should “be deprived of life, liberty, or property, without due process of law,” did not mean a judicial process, Holder claimed. Obama’s executive branch meetings to choose targets—dubbed “terror Tuesdays” in White House jargon—satisfied the “due process” clause. “Independent review,” like “due process,” is a concept perverted out of all recognition in the language of the Obama administration. It does not mean a review by an outside group genuinely independent of the military-intelligence apparatus, but rather an internal review by someone other than the individual agents who fired the missiles.